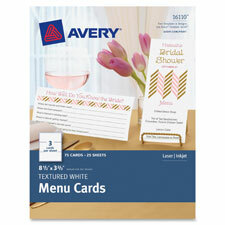 Create beautiful personalized menus for all your special events with these textured menu cards. They're also great to use for thank-you notes, invitations, programs and more. The heavyweight cardstock offers a polished, professional look to any celebration or event. These cards are also great for use at trade shows, sales events, open houses and other company events. Make your own custom cards using free online printable designs and templates. Colors and text print brilliantly on both sides of the card, allowing for easy personalization. 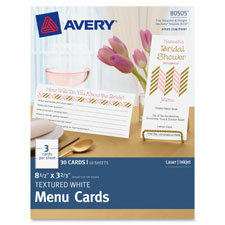 Add an elegant touch to all your events with these versatile menu cards. Each card includes three textured, perforated cards. Heavyweight paper is ideal for presentation covers, business cards, invitations and greeting cards. Print surface delivers superior results on a variety of copiers and printers. Compatible with copiers, plain paper fax machines, multifunction printers, desktop laser and inkjet printers, and offset printing presses. Made of 65 lb., acid-free stock. 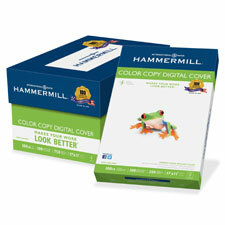 Color Copy Digital Cover works in color copiers, digital presses, laser printers, inkjet printers and fax machines. High-tech paper can take the heat and heavy applications of toner while producing photo-quality images. Super smooth finish provides a superior surface for perfect toner blending and brilliant color. Heavy 80 lb. weight enables better color registration and provides a more stable surface for heavier toner applications. 99.99 percent jam-free paper is acid-free for added archival quality that extends the life of the document. Color Copy Digital Cover works in color copiers, digital presses, laser printers, inkjet printers and fax machines. High-tech paper can take the heat and heavy applications of toner while producing photo-quality images. Super-smooth finish provides a superior surface for perfect toner blending and brilliant color. Heavy, 80 lb. basis weight enables better color registration and provides a more stable surface for heavier toner applications. 99.99 percent jam-free paper is acid-free for added archival quality that extends the life of your document. 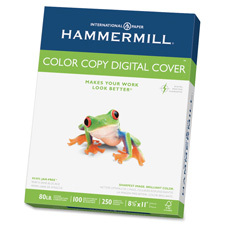 Color copy digital cover is a durable, cover weight sheet designed specifically for color copiers and color laser printers. This high-tech paper can take the heat and heavy application of toner while producing photo-quality images you will be proud to show off. Paper is extremely smooth to virtually eliminate paper jams. Acid-free material prevents yellowing over time to ensure a long-lasting appearance. 100 lb. 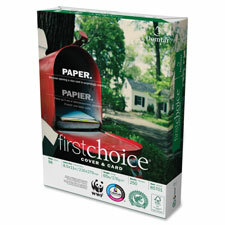 paper is perfect for premium color copies, proposals, presentations, menus, signage and more.